We’ve had great success this past year with our introduction of flavored oils, including a range of fruit-infused oils such as Lemon, Lime and Blood Orange, and fruit-based vinegars, like the popular Pomegranate Balsamic and Fig Balsamic vinegars. We are now getting ready to offer a new and exciting range of vinegars, both from California and from Modena, Italy. It took a lot of research and digging to find products that meet your expectations. First was the realization that unlike extra virgin olive oil - which is at its best when fresh - balsamic vinegars benefit most from a careful aging process. Next, it was critical that we find products to offer that are truly aged, and not just masquerading as such. Finally, the intense flavor had to be created from real fruit, not fruit flavorings like many other products on the market. We’ve found wonderful vinegars as close as California and as far away as Modena, Italy. 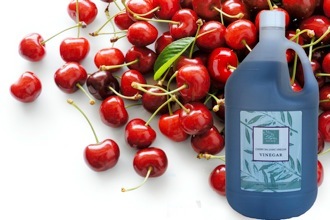 Our newest addition is Cherry Balsamic vinegar from California that tastes like the essence of cherries picked fresh from the tree and allowed to mature to a rich, ripe elixir. Expanding the line, classic balsamic vinegars from Modena will be available later this month that exemplify why the aging process is so important. They include a true 8-year old Balsamic and a true 10-year old Balsamic. We will also offer Raspberry Balsamic vinegar and Reduced-wine Balsamic vinegar. Fortunately for us, the research assignment doesn’t stop there, so we are traveling back to Italy in a few days to do more homework (well, can you blame us?). But we will expand the line only when we find the kinds of great new products that meet your expectations and ours. Buon appetito!